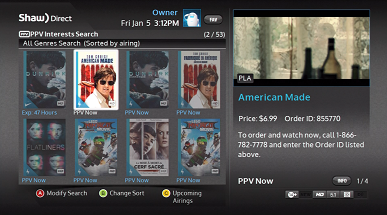 PPV Now allows you to watch the newest pay-per-view (PPV) movies loaded on your HDPVR at any time. Unlike traditional PPV movies, you don’t have to wait for a pre-scheduled start time. PPV Now is ideal if you’re unable to connect your HDPVR to your high-speed Internet services to take advantage of Shaw Direct On Demand. PPV Now titles will be grouped together at the very bottom of the PVR List. Press ENTER to see the available titles. PPV Now titles will appear at the start of the list with the lightning bolt badge. Unlike regular airings, they do not have a start time listed because you can start them immediately. PPV Now titles that are also available on the hard drive have a lightning bolt icon in the Guide grid. To order a live linear airing instead of the PPV Now version, use the "Upcoming Airings" function. Find a PPV Now movie, as indicated by a lightning bolt icon, and highlight it. Your order will be confirmed on-screen, and you will be prompted within 60 seconds to “Watch now”. If you miss the prompt or want to start the movie again within the 48 hour viewing period, find the movie again (ordered titles will feature a blue checkmark), press ENTER, and select “Watch this recording” to begin playback. Find a PPV Now movie, as indicated by a lightning bolt icon, highlight it and take note of the “Order ID” on the right-hand side of the screen. Call 1-866-782-7778, follow the prompts and enter the Order ID you noted earlier. If you miss the prompt or want to start the movie again within the 48-hour viewing period, find the movie again (ordered titles will feature a blue checkmark), press ENTER, and select “Watch this recording” to begin playback. Note – Shaw Direct Customer Advisors are not able to order PPV Now titles for you. Can I limit PPV Now movies by language? Yes, you can choose to have only English or only French movies pre-loaded for you. 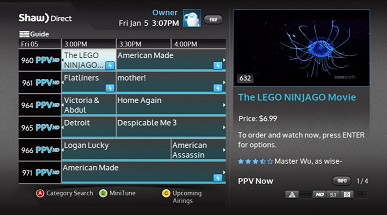 Press OPTIONS, select “Preferences”, expand “Tuners & Storage” and use the RIGHT or LEFT arrows to set your preference under the PPV Now option. Why don’t I have any PPV Now movies available? PPV Now movies will only be pre-loaded onto your HDPVR if there is enough hard drive space, with consideration to your existing and upcoming recordings. PPV Now will never conflict with your recordings. 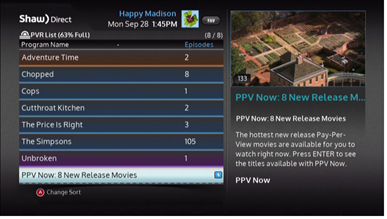 As well, PPV Now will be unavailable if your PVR is operating in Single Tuner Mode. A movie I wanted to watch was there, and now it’s gone – what happened? Your HDPVR will automatically manage the PPV Now library. A movie may have been deleted because space was needed for an upcoming recording or newer PPV movies, or the PPV movie may no longer be available due to scheduling and licensing. You can use Search to check for alternate airings, when available. Will PPV Now ever delete my recordings? No. PPV Now will only ever utilize unused hard drive space. If the hard drive gets close to capacity, PPV Now movies will always be deleted before your recorded content, and will never conflict with upcoming recordings. Does PPV Now consume Internet bandwidth? No. PPV Now movies come in over the satellite, just like traditional PPV. If you order the movie via your remote (using your internet connection), the amount of bandwidth used is extremely minimal. Can I delete PPV Now movies? You are able to delete PPV Now movies from within the PVR List entry – just press C while the title is highlighted and confirm. If you only have room for a few movies, deleting ones you are not interested in could allow room for another one that you may want to watch. Can I disable PPV Now? Yes, PPV Now can be completely disabled by pressing OPTIONS, going into Preferences, and disabling the PPV Now option under the “Tuners & Storage” header.